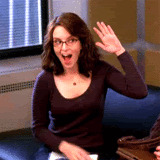 Liz Lemon sends a high-five to you, writer! Nice work! Well now I’ve gone and done it. I’ve completed 30 days straight of daily blogging for National Blog Posting Month. It came at the expense of writing a novel this year for NaNoWriMo, but it’s best for my health that I didn’t seriously attempt to do both. I did start out doing both, but chose to continue only with this one after day three because it’s a lot less time-consuming to blog daily than it is to write a novel. Ask me how I know. Why did I do this challenge? I’d heard about it for the past few years and I hadn’t tried it before. So, why not? I wanted to see if it would be difficult to do. Like most creative challenges this basically came down to a test of will power to sit down and write. Finishing up my last two books for the 2013 Goodreads challenge to read 27 books this year. I have ~200 pages to go in my penultimate book. Checking out the NaBloPoMosphere and reading what others have written in November. I’d like to say thank you to all who have read and then “liked”, left a comment, or subscribed to my blog this month. It was a bit of a process getting into daily writing but should I scale back in December– and I probably will– I should have a more little time to check out your blogs and perhaps say hi. Now it’s time to get some rest. December is going to be a busy month! This entry was posted on Saturday, November 30th, 2013 at 11:59 pm	and tagged with aoje, emma approved, goodreads, Liz Lemon, nablopomo, nanowrimo and posted in Uncategorized. You can follow any responses to this entry through the RSS 2.0 feed. « Got 4-day weekend paranoia? I do.